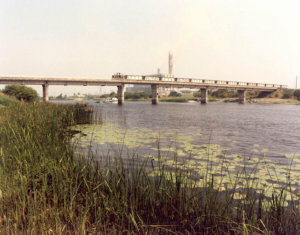 There are 90 bridges carrying country roads over Bord na Móna‘s railways, or carrying the railway over canals and rivers. The road bridges are of reinforced concrete box culvert type designs. The river bridges are in general 12m (39ft) to 30m (98ft) in span with steel decking on reinforced concrete abutments on piles if required. The River Shannon bridges at Lanesboro‘ and Shannonbridge Power Stations are of course much larger structures. The Lanesboro‘ bridge is 118m (386ft) in length, and is composed of five 18.3m (60ft) spans, with two end spans of 6m (20ft) and 10.7m (35ft). The piers of that bridge are manufactured from reinforced concrete, whilst its superstructure is of steel. The bridge at Shannonbridge, (Garryduff Bridge) it is 160m (525ft) in length. There are also three crossings of the Grand Canal, the most recent being an elaborate swing-bridge constructed near Pullough village in 1987. Based on a British Waterways design, this bridge is operated by an electrically driven rack and pinion motor. The bridge opening mechanism, which temporarily closes the canal to boat traffic, is operated by the locomotive drivers using a key pad and code number. Bord na Móna operates 41 level crossings on county roads. Trains have been essential for Bord na Móna to move peat from the bogs. Read More.